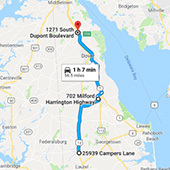 Our Milford, Delaware Dealership is conveniently located off of Highway 113 a couple miles off Route 1. We have a huge inventory of RVs for Sale in Milford, Delaware, so feel free to browse our inventory below and give us a call or fill out our contact form when you find the perfect RV! Can’t find the perfect RV? Give us a call, we’ll find it for you!